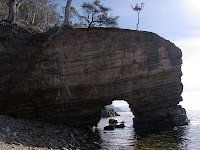 In the Sunday Tasmanian last weekend, John Cannon wrote about some walks south of Kingston. Firstly, there was the walk to Fossil Cove. A well made track descends to the coast from the end of Fossil Cove Road, which is a little way south of Blackmans Bay. The small cove has a variety of interesting features. 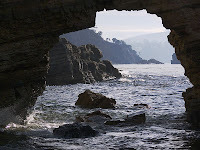 To the north is this natural arch, cut by the action of the sea into the Permian sedimentary rocks. You could wade through the arch when the tide wasn't too high. 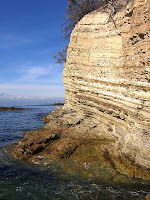 The cliffs here are formed of tilted layers of Permian rocks. 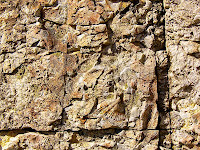 The cliffs are somewhat fractured and crumbly, and overhang in places. You can fairly easily move southwards around the wave-cut platforms for a short distance. 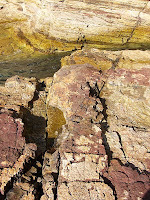 In the rock platforms and cliffs are a great many fossils, hence the name of the cove. At high tide the platform would be awash, at least in places. There is also this dyke of igneous rock which has intruded into the sedimentary rocks, cutting across beds, splitting them apart, and climbing the cliff. I'm assuming it's dolerite, as this is in evidence nearby at Tinderbox.